The Constitution Hill Trust helps South Africans to respect their constitution, human rights and democracy through their experience of the Constitution Hill precinct. The Hill serves as a living memory of South Africa’s transition to democracy and a place where our shared heritage and common future, founded on South Africa’s constitutional values, is celebrated. 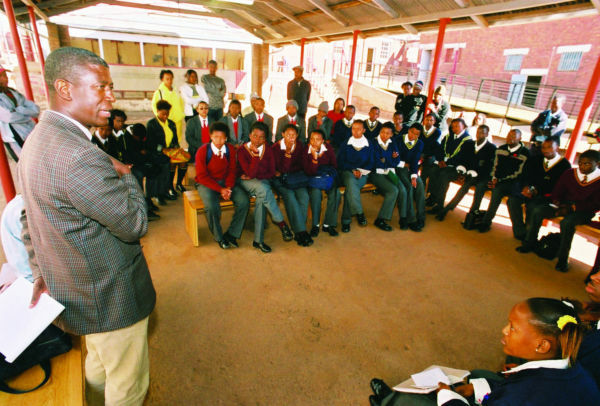 We also run programmes that awaken young South Africans to the Constitution, its principles and workings, and to the value and importance democracy and human rights. Since its inception, the Trust has hosted biannual dinners to raise corporate sponsorship for its work. Over 7-million rand have been raised this way. 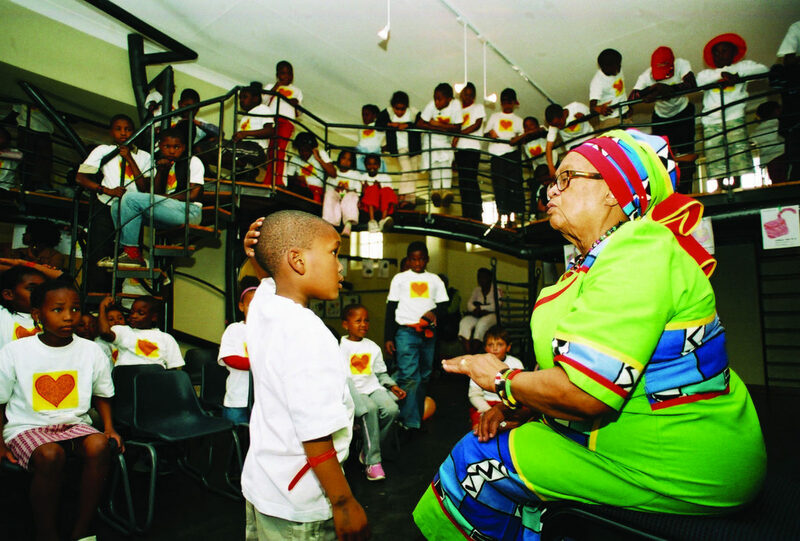 This funding has been used primarily to bring more than 100 000 school-going youngsters from underprivileged schools to visit Constitution Hill. 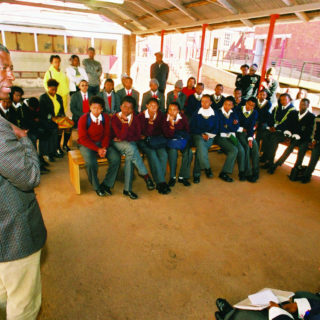 Once at the site, the learners participate in programmes that focus on understanding South Africa’s transition to democracy and the importance of our constitution as our guarantor of human rights. The Trust has also channelled money to a number of non-governmental organisations working on constitutional issues. The South African Institute for Advanced Constitutional, Public, Human Rights & International Law (SAIFAC) has received the most funding to date. In 2011, the Trust raised an additional R6-million for a special celebration in honour of the 15th anniversary of the constitution. 10 December 2011 was the 15thanniversary of the signing of the final draft of the new South African constitution at a stadium in the township of Sharpeville. The photograph shows a jubilant Cyril Ramaphosa holding the newly signed constitution aloft with former President Nelson Mandela at his side. In celebration of this momentous occasion, the Constitution Hill Trust developed several important and exciting initiatives. The Trust launched a project to archive the making of the constitution. Our researchers were granted special permission to access the Codesa (Convention for a Democratic South Africa) and constitutional assembly archive at the National Archives of Pretoria. We accessed important documents and videos and produced digital copies of some of the most seminal material, which is now stored at the Nelson Mandela Foundation. The team also drew up an inventory of where all the other important collections related to the constitution are housed. Using the archival material, the Trust published One Law, One Nation. The book documents the history of the struggle for constitutional rights in South Africa, and the complexity of, and obstacles to, the constitution-making process after 1990. Using archived photographs and interview material unseen until then, including Mr Mandela’s handwritten notes from the negotiation process, the book tells the story of South Africa’s remarkable constitution. Many books have shed light on the legal aspects of the South African constitution, but few offered first-hand perspectives of the hidden history of its development. 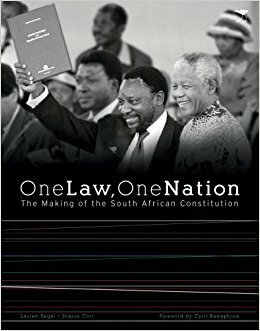 One Law, One Nation also reflects on the constitution as a living document, and how the Constitutional Court plays an instrumental role in ensuring that the human rights enshrined in it are upheld in South Africa’s democracy. The Trust also mounted an exhibition in the foyer of the Constitutional Court in honour of the 15th anniversary celebrations. For the first time, each of South Africa’s five consecutive constitutions was on view. Seen together, they graphically illustrated the country’s journey to democracy. Indeed, the final signed copy of the 1996 constitution, which had never before been on display, took pride of place directly outside the chamber of the Constitution Court. The three maces used in Parliament to signify that the House of Assembly was formally in session, and that the proceedings were official, were also on display. These beautifully carved gold rods also graphically represented South Africa’s history and traditions, with the final People’s Mace of 2005 for the first time being truly inclusive of the diversity of all South Africans. The second part of the exhibition, mounted in the Constitutional Court’s art gallery, led the viewer along 15 steps in the story of the making of the final Constitution. Artworks were juxtaposed with documentary archive to represent each of the important moments in our history that culminated in the enshrinement of freedom, dignity and equality in our society today. The artworks ranged from striking photographs to paintings and embroidery, and were drawn from many different communities across the country and from across the decades. 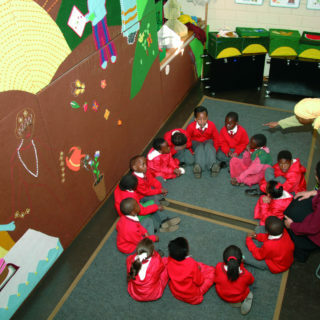 There were two paintings that artist Gerard Sekoto painted in exile and that represented the Sharpeville massacre; a Gavin Jantjes collage represented life under apartheid; there was a Willie Bester piece made out of fragments left behind on the site of the 1992 Bisho massacre; and the Keiskamma Tapestry weaved the story of freedom in South Africa since 1994. Many of the documents – such as the letter of protest against the 1910 constitution, the African National Congress’s 1923 Bill of Rights, the handwritten Verwoerd letter appealing for the Republic and the recently acquired copy of the Freedom Charter signed by Albert Luthuli – have all seldom been seen. They all shed new light on the history of the country. The exhibition was housed in the Constitutional Court building for four months. As part of the 15th anniversary celebrations, the Trust also installed the perpetual flame of democracy to symbolise the enduring commitment of South Africans to democracy and constitutionalism. The flame was ignited by Nelson Mandela. Trustees flew to his hometown Qunu in the Eastern Cape, and the former president lit a paraffin lamp that was brought back to Johannesburg. On 10 December 2011, then Deputy President Kgalema Motlanthe and then Chief Justice Moegeng Moegeng used the lamp to light the Flame of Democracy in front of a large gathering of dignitaries and corporate sponsors, as well as many of those who were intimately involved in the writing of the final constitution. The flame, in its beautifully crafted copper bowl, now stands in one of the four remaining stairwells of what was once the precint’s awaiting-trial block, directly opposite the carved wooden doors of the Constitutional Court building. This symbolic placement, inside the arched entrance alcove, draws focus to the threshold between incarceration that was once part and parcel of life under apartheid and the hard-won freedoms that are the foundation of South African life today. A beam of light, projected into the Johannesburg night sky as a visible reminder of our democracy, was switched on for the first time as part of the anniversary celebrations. The flame has become an iconic tourist attraction at Constitution Hill and many important groups have been photographed in front of it. The Trust created a curriculum for more in-depth workshops on the constitution and its meaning in our democracy. 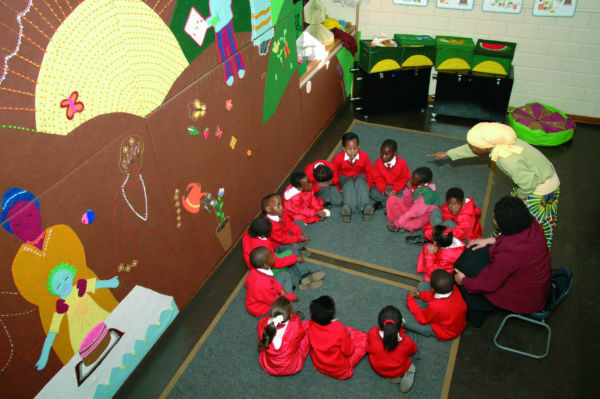 These workshops are held on Saturday mornings for small groups of learners from schools throughout Johannesburg. Law clerks of the Constitutional Court and volunteers from different law firms run the programme as volunteers. 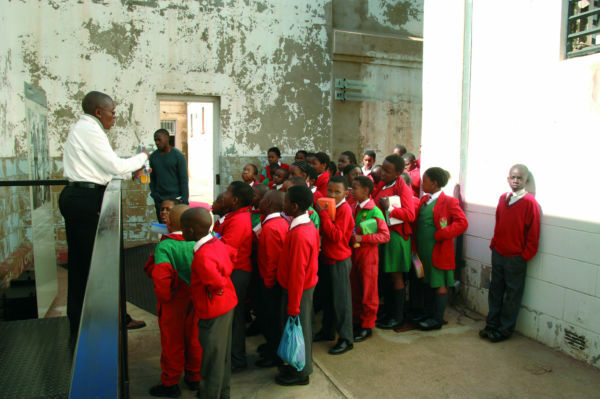 In 2016, this successful educational initiative was incorporated into the programme offering at Constitution Hill. We are at an important crossroads in South Africa – we are more than 20 years beyond the drama of our country’s transition, and are looking forward to a fifth democratic election in 2019. The political terrain has shifted dramatically over the last years, with an explosion of robust debate and controversy. This current political climate presents an ideal moment for South Africans to reflect on what democracy means to us and on how we can ensure that the human rights enshrined in our magnificent constitution are upheld. It is an ideal moment to open debates about our heritage, and about how democracy and human rights are being preserved and represented in our museums and schools. The passage of time since 1994 also affords us a unique vantage point, a place from which we are able to reflect on and talk about these issues in ways that could not have been possible during the cut and thrust of building a new constitutional democracy. With the luxury of hindsight, we can now consider the foundational notions of our nation-building project and assess the impact of the constitution – what Deputy President Cyril Ramaphosa has referred to as “a firm foundation upon which the dreams of millions of South Africans could be realised”. The Constitution Hill Trust continues to raise funds to enrich the dialogue around constitutionalism in South Africa; to refresh and revitilise the exhibits in the prison buildings; and to ensure that important programmes continue in support of its core objective. The Trust welcomes support from all South Africans, individual, corporate and public, who wish to support this cause. 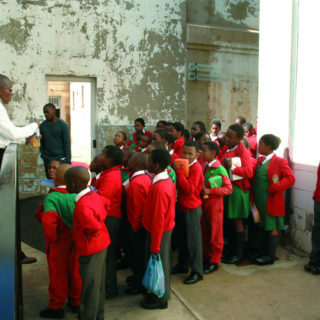 In addition, the Trust needs to continue its fundraising endeavours to ensure that disadvantaged learners are able to tour the prisons and the Constitutional Court and to gain a profound insight into our struggle for democracy in the past and the importance of our constitution in the present. The original vision for Constitution Hill was to create a large-scale, mixed-use precinct with a visitor centre, conference venues, offices for non-governmental organisations, a justice college, exhibitions and retail space. The new Visitor Centre, which is at the heart of this this initiative, will be built during the course of 2017. The Trust will be assisting the Constitution Hill management to ensure that this development is achieved in such a way that the complex remains a symbolic focal point of South Africa’s founding aspirations. The launch of a “We the People” campaign which will consist of different components, including a walk on Human Rights day that starts and ends at Constitution Hill; a public art campaign; a series of lekgotlas at the hill; a campaign to ensure that the mini-constitution is handed out in schools and retail outlets across the country. The Constitution Hill Trust is a registered Section 18a organisation. All individual and corporate donations to the trust are tax-deductable.